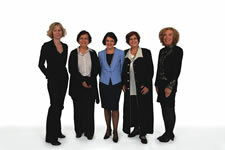 L’OREAL-UNESCO Award Laureates 2010 (left to right): Prof. Anne Dejean-Assemat (France), Prof. Lourdes J. Cruz (Philippines), Prof. Alejandra Bravo (Mexico), Prof. Rashika El Ridi (Egypt), Prof. Elaine Fuchs (USA). The preceding winners of the 12th Annual L’Oréal–UNESCO Awards For Women in Science received their prizes at a ceremony on 4 March at UNESCO, in the presence of Irina Bokova, director general of UNESCO, and Sir Lindsay Owen-Jones, chairman of L’Oréal and of the L’Oréal Corporate Foundation. UNESCO–L’Oréal also awarded 15 International Fellowships to doctoral and post-doctoral women to allow them to pursue their research in host laboratories outside their home countries.